Singer 1304 Start Sewing Machine is designed for beginners and hobbyists. It gives them just enough features to get their creativity off the ground. Singer Start comes with 6 basic stitches with preset stitch length and stitch width. As a beginner you do not have to guess stitch length and stitch width you just have to choose a straight stitch for basic sewing, sew a simple applique with a zigzag stitch, fix a hem with the blind hem stitch, or sew a decorative scallop stitch to embellish almost anything. That is how basic it is. 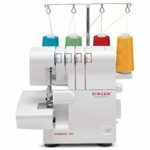 Singer 1304 comes with Four-Step Buttonhole feature that allows you to add buttonholes in four easy steps on things like pillows, children’s clothing, fashions and more. Threading it is a breeze because it comes with threading diagrams printed right on the machine so you can be set-up in no time. Let us have a brief look at some of its features that make this sewing machine for beginners in 2018 the best. As a sewing machine for starters, it is not complicated and is user-friendly. 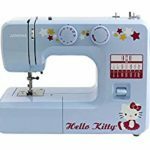 This is beginner sewing machine enjoying a lot of positive reviews especiallt that it is also the best sewing machine for making clothes. 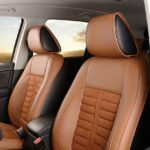 At the time of this article, there just over 650 user and customer reviews at Amazon. The Singer Start 1304 scores just over 82% as a generally loved starter sewing machine. The other 18% have also expressed their frustrations about this portable, lightweight sewing machine. Let us briefly take a look at some of the outstanding likes and dislikes of this unit. The Singer Start is a portable sewing machine that can be carried around with ease. This is especially ideal if you need to use a sewing machine for classes. This is a sewing machine with free arm that can be exposed by sliding off the removable extension table. The free arm can be used for hemming trousers and sleeves or for sewing other small projects. One attribute that was liked by most beginners is how quick it is to set it up. One user commented that they have never sewed let alone operate a sewing machine before, but in 45 minutes they were able to set up this Singer Start 1304. And start sewing with no qualms. Some fairly intermediate sewers commended it for not overwhelming to a new user such that even kids can learn sewing with it. 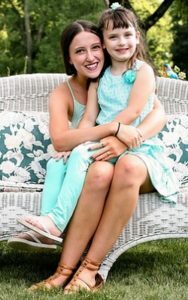 Some users, however, complained that it does not last and breaks quickly. The sewing machine carries a 25 year limited warranty which means if breaks it is possible to return it as long as the reason for return is covered by the warranty. So it would be important to read the warranty manual. Some complained about the tension, complaining that time and again they have to adjust bobbin tension. Majority of the 18% critical reviews about this Singer mechanical sewing machine are around bobbin issues. Normally that is a frustrating issue with most sewing machines. At times re-reading the manual to understand how the bobbin should be fitted solves this problem. 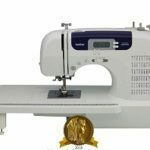 For a good Singer Start 1304 price visit Amazon.com because it normally cheaper especially the sewing machine has Free Shipping. So you will save because of the normally lower Singer 1304 price. You will also find that 650+ reviews and 275+ questions and answers give a better insight before you purchase.